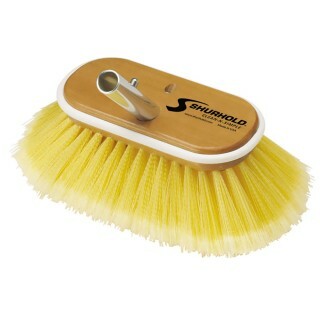 Shurhold’s classic series of 6 inch (15 cm) deck brushes that easily and positively lock into any Shurhold handle. Each brush is based out of a solid wood block and has a rubber wrap around bumper to prevent marking the surface. Stiff- white polypropylene bristles for teak, below the water line and other tough surfaces. Medium- yellow polystyrene bristles for textured and non-skid surfaces. Soft- yellow polystyrene bristles with split end fibres, safe on gelcoat, clear coat, fiberglass and paint. Extra Soft- blue nylon bristles ideal for delicate surfaces like isinglass and Plexiglas.